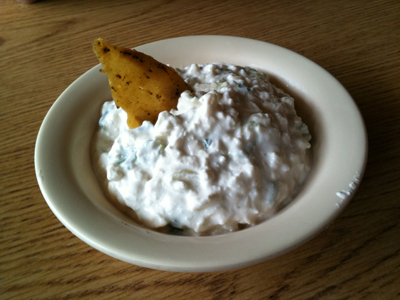 If you come to a get-together at my house, you will most definitely find 2 or 3 dips being served. They are like a casserole to me, filled with a mixture of pleasing ingredients that just work well together. Easy to make and guests love them. All the the ones I serve have few ingredients, which every host can appreciate, and usually take less than 15 minutes to prepare. They are truly a planner's dream. First, I am sharing one of my family's favorite dip recipes, and below that, you will find other recipes that we use on a regular basis. Enjoy! Every Michigan State University alum knows about El Azteco (fondly referred to as "El Az") and their famous El Azteco Cheese Dip. It was one of the cheapest places in town to eat so I was there regularly and NEVER did I miss ordering this beloved appetizer. When we were at MSU recently for a U2 concert, of course we had to visit El Az and order the cheese dip. I snapped this photo so you could get a look at the real stuff. Here is how it's described on the menu "A delicious combination of cottage cheese, sour cream, muenster cheese and spices." Of course, they call it a secret recipe, but I am quite certain you will love our version of this cheese appetizer. It is as close to the original as you can get. In a food processor, mince jalapeno and garlic. Add Muenster, cottage cheese and sour cream. Process until not quite smooth. Fold in green onion tops. I never would have thought it was made with cottage cheese and at first I thought that was kind of weird, but trust me, it is a keeper. Note: If you have time, let it sit overnight to give the ingredients a chance to marry. The longer it sits, the better it gets. 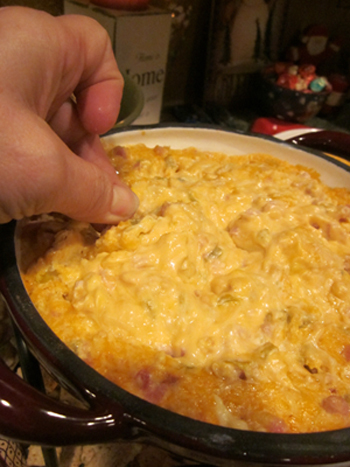 My friend Saundra recently brought Green Chili Ham Dip to a get together we had at our house. I loved it so much that I made it for a party we were attending the very next weekend. I snapped the photos below as I was making it so you can see how easy it is. With only 4 ingredients, you can whip this together in no time especially if you keep smoked ham in the freezer like I do most of the time. The other ingredients are staples in my house all the time. 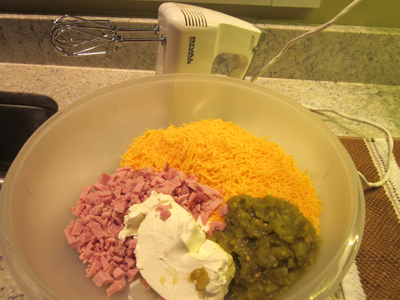 Using a hand mixer, combine cream cheese, ham, shredded cheese and green chilis. 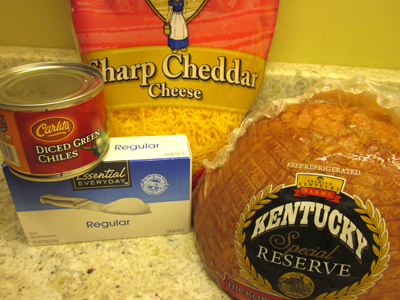 The ingredients you see in this bowl have been doubled (2-8oz cream cheese, 2-8oz shredded cheese...). Empty the very thick mixture into an oven safe dish and bake at 350 for 30 minutes until top is lightly browned and mixture is bubbly. Serve with your favorite crackers and bread chunks. This Green Chili Ham Dip is best served warm. NOTE: I used Sharp Cheddar when I made it and thought the cheese overpowered the ham. The next time I make it I will use Mild Cheddar. Giada DeLaurentis is one of my favorite Food Network stars and I love watching her cook. She uses simple ingredients and comes up with the best combinations that are healthy and perfect party food. In this video she shares how to make her Sweet Pepper Crostini. She uses smoked mozerella to give them more flavor. A smoked Gouda would be outstanding too. Click on a link below to see what other visitors have contributed. You'll find more great appetizers like Layered Greek, Green Goddess Cheese and Bunco Bacon. While you are there, please share one of your favorites appetizers with the rest of us.